With the BC Lions gearing up for the Canadian Football League draft and about to start free agent camps all over the US, the club has three major areas of concern heading into the season. New head coach Jeff Tedford is already bearing fruit for the Lions with his US connections, as evidenced by the signing of a highly regarded QB prospect in Greg McGhee. Hopefully the Leos can uncover a few more gems over the next few months, but here are three key areas they need to address before training camp. Minus Kevin Glenn, the Lions have chosen to stick with what they had last season, while adding McGhee as a work in progress. The condition of Travis Lulay is a huge and legitimate concern that has yet to unfold. The Lions would dearly love for Lulay to be strong from the start of camp, but they also want him to realize he has to change if he’s going to stay healthy. That’s a feat that will be easier said than done with a competitor such as Lulay, but at this point in his career he really has no choice, and he’s a lot more valuable to the Lions with his knowledge, leadership and experience than he is trying to recover a fumble or getting that extra yard. Behind Lulay the depth chart likely goes like this; John Beck, Travis Partridge, Jordan Rodgers and Greg McGhee. While that will likely be the order heading into training camp, Jeff Tedford comes to the Lions with the reputation of being able to develop quarterbacks, and Wally Buono is no slouch in that department either. The Lions obviously feel they have some good options here, and will get their first chance to evaluate them at their offensive mini-camp in April. Don’t be surprised if the pecking order changes over the first few weeks of training camp. 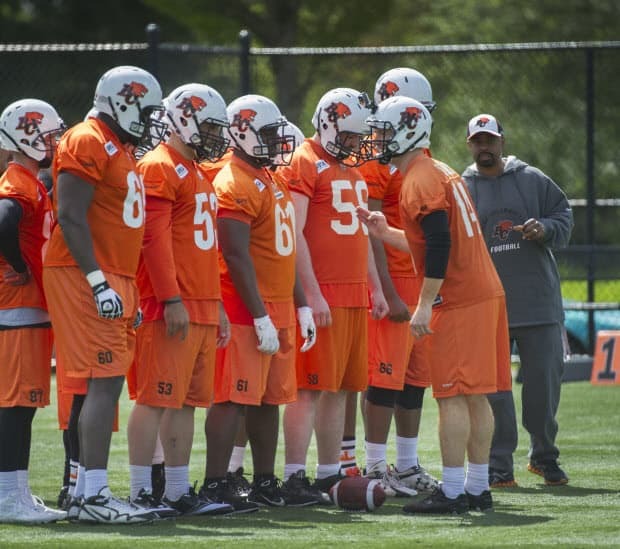 Paramount to the success of Travis Lulay will be the ability to keep him protected, and the Lions took the first step in that direction by going in a new one with new offensive line coach Doug Malone. Malone was in charge of a pretty good offensive line in Saskatchewan, both at protecting the QB and opening holes for the run. Contrary to some opinions out there the cupboard in BC isn’t bare, it just has to stay healthy and have a chance to get cohesive. The Lions are solid with Jovan Olafioye at left tackle, while Jermarcus Hardrick showed he could play last season. Hunter Steward also did well at right tackle last season before getting hurt. The real question is what happens on the interior of the line. The Lions really need solid contributions from both Steward and Kirby Fabien. Fabien showed such promise in his rookie year before his devastating knee injury, but struggled last season both physically and mentally. T-Dre Player will also be a season wiser, after spending much of last season on the practice roster. The Lions extended Cameron Thorn and there is talk of him competing with Matt Norman at centre, perhaps giving the Lions the option to use him at guard. Dean Valli will also return, but the Lions need to have their youth start to emerge and succeed while also looking to add to this pool in the draft. Paul McCallum is the only kicker currently on the roster, which will no doubt change before training camp. The future hall of famer is a safety net for the Lions, but they would dearly love to find someone who can handle all the kicking duties. They hoped they had found that with Richie Leone, but lost him when he found work with the Pittsburgh Steelers. McCallum’s leg certainly isn’t what it used to be, but he is a solid directional punter. The Lions will give up field position and long field goal attempts if he is the best option. Look for at least two bodies to join him in Kamloops.